Ever wanted to stay in a Penthouse apartment? Well now you can! After climbing up 4 small flights of stairs (sorry no lift), you will be rewarded with upfront in-your-face water views. After catching your breath, you can explore the views from all the windows, each one a different vista. Completely refurbished and new, you can relax in comfort, with reclining seats on the couch, new luxury queen bed, and spacious bathroom. With everything at your fingertips downtown, you are at the hub of Tauranga CBD, but without the crowds. 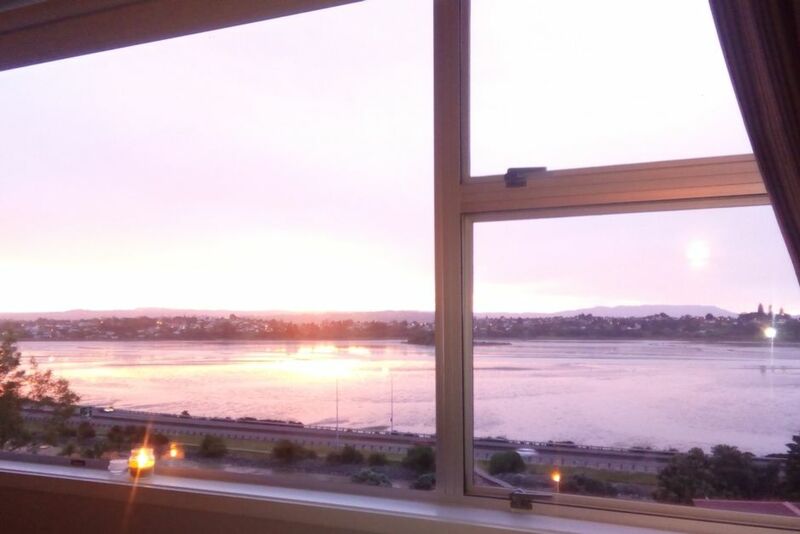 The Penthouse awaits your next stay in Tauranga. No smoking, no parties or loud noise, not suitable children or pets sorry. Linen fee is typical of a 2 night stay, with the bed made up for you. This will increase for longer stays. Walk down the hill 100m to Tauranga CBD. Stunning views over Tauranga harbour. Fantastic stay really lovely place so close to everything. Would definitely stay again!! The penthouse apartment was exactly as promised - clean, well equipped, tastefully decorated and very comfortable for 2 people. The 49 steps up helped to keep us in shape from all the dining on the Strand, only 300 metres away. There were views from all 4 directions, with a gorgeous sunset most every evening, and beautiful cross breezes which kept us cool each night. Easy check in and out. We have rated this property a 4; we would have given a 5, but there was no WiFi available. Great studio apartment with everything provided for a comfortable stay, central to the city centre. Great studio apartment with everything provided for a comfortable stay, central to the city centre. Highly recommended.